Here we go with Zoo Zoo, Herriman's first continuing comic strip for the LA Examiner. Not only an early Herriman (quasi-) daily, but starring a cat! Though Zoo Zoo is relegated to a spear-carrier part in the second strip, the kitty will regain its starring role in the next strip. In case you don't follow the gag in the second strip, Evangeline's dress is shrinking in the rain. A woman showing an ankle in those days was well worth an ogle-fest from the menfolk. 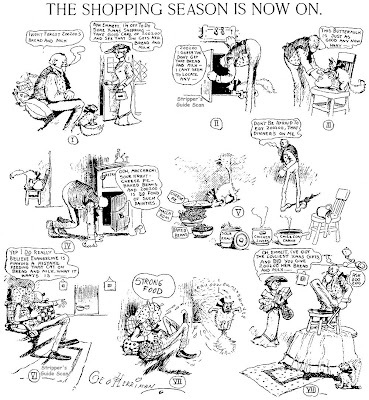 These cartoons appeared in the LA Examiner on December 10 through 12 1906. 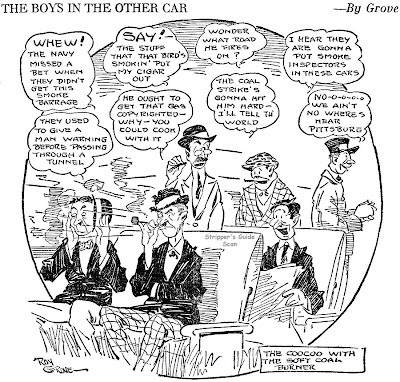 Roy Grove, a cartoonist in the NEA stable from 1917 until the mid-20s, did his best work on this daily panel, The Boys In The Other Car. The cartoon was derivative, taking its cue from features like Indoor Sports and Eddie's Friends, but a good read nevertheless. The cartoon was about the ribbing and playful banter that occurred on commuter trains. In those days when the suburbs were beginning to sprawl across the American landscape businessmen seldom owned cars, so their daily commutes were by rail. Each car on the train evolved into an informal club with twice daily get-togethers. Grove had a good ear for dialog and the slang-laden snarky badinage rings true. It's also pretty darn funny stuff. I wonder, though, if anyone other than a few of us retrospective types can even make sense of the subject matter and archaic jargon in this feature. 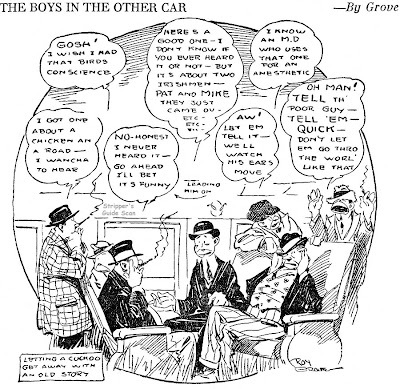 The Boys in the Other Car ran from November 26 1919 through August 6 1920. For whatever reason I was checking out Roy Grove a few weeks ago. 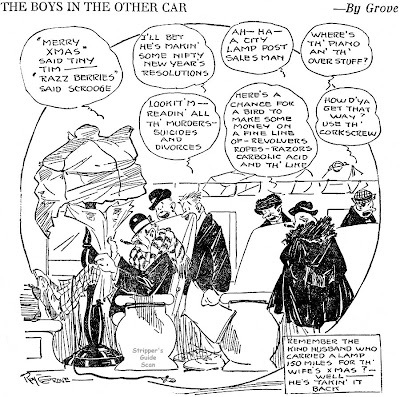 As J. Roy Grove he has a page at the Cleveland State University Library where they reproduce some of his WWI cartoons as published in Scripp's Cleveland Press. He also seems to have been a sports writer for NEA, specializing in golf. 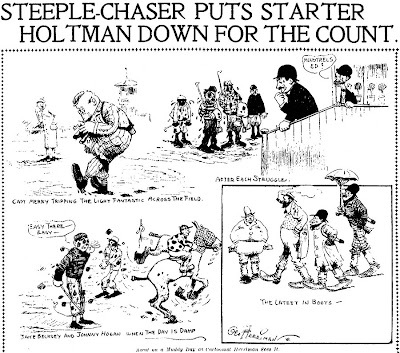 Later, in 1930, he was doing an illustrated golf column for Central Press titled "From Tee to Green". That Library page above has some later attempts by him to get syndicated in the 1930s with something called the Jeburn Features Syndicate. You got anything on that JFS? A staffer in charge of that page sent me a query about Jeburn few months ago. Unfortunately I have never heard of it and have never seen these Grove tryouts reach the published page. 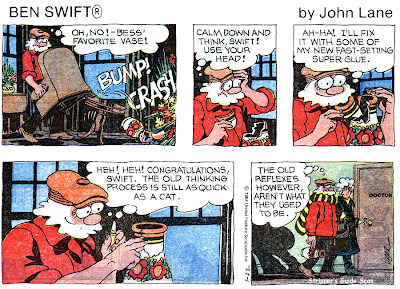 Ben Swift was one of the early entries in the now burgeoning genre of strips about older folks. Ben was a retired newspaper editor living in a small but comfortable country home, and his main foils were wife Bessie and grandson Petey. 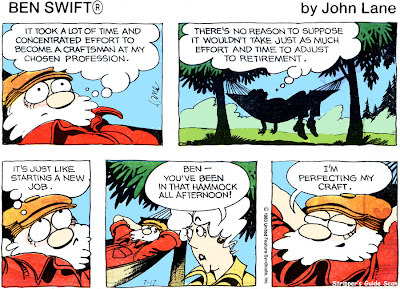 Although the strip was rarely laugh-out-loud funny, Ben's low-key observations on life were pretty consistently entertaining and often quietly captivating. John Lane, the creator of Ben Swift, was a longtime art director for United Media and no stranger to the comics page. 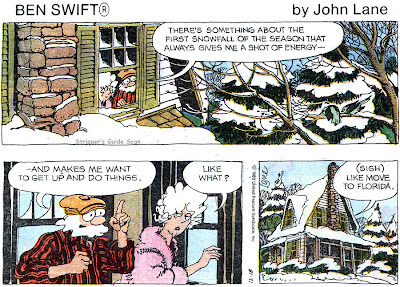 He handled the art on many NEA and United Features limited-run strips, including three of NEA's Christmas strips. He gave up that job to create Ben Swift which started on February 16 1981. The strip got picked up by a decent number of papers right from the start but from what I've seen many of them didn't stick with the strip for very long. Ben got his gold watch on February 17 1985. A clue to the strip's lack of success can be found reading an interview with Lane printed in Cartoonist Profiles #50 (June 1981). In response to a question from Jud Hurd as to the genre of the strip, Lane says, "After the [original] retiree promotion was out, someone said, "How embarrassing that is -- you don't have to attract senior citizens to the newspaper -- they devour the newspaper!" But the strip isn't just about a retired person ... it's a family strip." Sounds like Lane was insecure about his choice of subjects and a few blustering editors had convinced him that a strip about a retiree wasn't marketable. 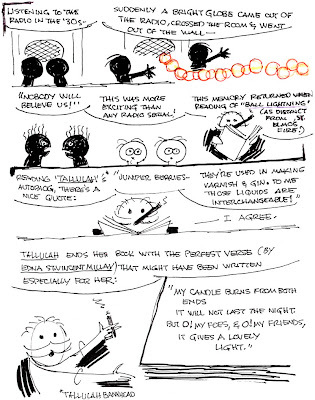 In response to these criticisms, ridiculous as they were, Lane was adding a whole raft of additional characters to the strip diluting its original appeal. My guess is that things all went downhill from there. Here are a few really bad samples from microfilm of the very rare Philo Vance comic strip. It was distributed by Bell Syndicate and seems to have been released between two more popular series of the same genre, Sherlock Holmes and Fu Manchu. These Bell series were notable not only for their fan-favorite characters but also their very short stories, rarely running more than a month long. Without much chance for character and plot development they make for pretty dull reads though collectors seek them out because of the famous subjects. Philo Vance was an amateur detective created by S.S. Van Dine. Vance, a a foppish man about town appeared in a series of bestselling novels. The character was popular enough to have many of his tales adapted into movies, some starring the great William Powell (unfortunately missing his Thin Man better half Myrna Loy in these outings). The only paper I've found that ran Philo Vance is the Atlanta World, a black daily newspaper whose microfilm, as you can tell from the quality of the scans, is in awful shape. The World ran only two stories - The Insurance Mystery (story E) and The Skull Mystery (F), each 24 strips. F seems to have been the last in the series, leaving 4 stories unaccounted for. The strip was credited to Van Dine, of course, but he almost certainly had nothing to do with these productions. The name signed to the strips is R.B.S. Davis who is a complete mystery to me. Providing running dates for any of these Bell mystery series is tough because the strips were sold in batches. Some papers ran them late and out of order, and very few newspapers stuck with the series all the way through. Philo Vance is a particularly tough nut to crack because it is far rarer than the other two series, and the more popular Sherlock Holmes and Fu Manchu series weren't exactly running in a lot of papers themselves. My guess that this strip was meant to run between the other two (which would have it starting around April 1931) really isn't borne out by the tentative running dates I have for the other two strips, but as I said, they ran in very few papers, seldom as a complete series, and frequently out of order. If someone has made a study of this trio and would like to compare notes I'd love to hear from you. I think you're absolutely right saying that Van Dine had nothing to do with it. Even if all the original books (but the last) start with a "dramatis personae", it seems suspicious that the two known comic stories titles aren't "The [...] murder case" but "The [...] mistery", given that all the 12 Vance novels have as title "The [...] murder case". It seems to me that the stories weren't "translations" of Van Dine books. And this is very different from the two O'Mealia strips (SHERLOCK HOLMES and FU MANCHU), that were strictly based upon original novels (and had no ballons). BTW in 1931 Van Dine had written only his first 5 Vance novels. My reason for lumping the three together, despite the artistic and source differences you point out, is that they're all mysteries, appeared in the same timeframe, used those story letters, and in the World at least the Fu Manchu series started at the end of the brief Philo Vance run. Hello, Allan----I wonder who was the "S.J.Wright" in the PHILO VANCE copyright? ------These strips were based on Van Dine's actual writings. "THE INSURANCE CASE" is actually his Vance novel "THE COLE CASE", and I venture to guess "THE SKULL CASE" is really "THE SKULL MURDER CASE". Perhaps the names were changed to prevent some kind of conflict of interest, since the novels and films of these stories were then current. ------Cole Case Johnson. Dunno -- kinda assumed it was Van Dine's publisher? So there's a Vance novel titled THE COLE CASE? I never heard of it (but I'm not a PHILO VANCE expert). I have read all 12 Vance novel (if they're really 12) and no Coles in them. When the strip presumably, started only first 5 novels were already written. Maybe THE COLE CASE was a Vance short story or was a S.S. Van Dine novel with with other characters? In this second option, the cartoonist, having no more Vance novel to adapt, started adapting Van Dine (no Vance) novels. Hello, Everyone----I ask your forgiveness. THE COLE CASE and THE SKULL MURDER MYSTERY were not actually Philo Vance stories, but from another series that S.S.Van Dine wrote, centering on "Dr. Crabtree", an elderly amateur slueth, and "Inspector Carr", his stock befuddled foil from the police department.These were made into a series of twelve two-reel shorts by Warner Brothers in 1931-32, starring Donald Meek as Dr. Crabtree, and John Hamilton (best known as Perry White on the SUPERMAN TV series) as Inspector Carr. For some reason, it seems some of these were adapted to be Philo Vance stories. The titles of the Dr. Crabtree films, officially known as the "S.S.VAN DINE MYSTERIES", are: 1]-THE CLYDE CASE 2]-THE COLE CASE 3]-THE SYMPHONY MURDER MYSTERY 4]-THE CAMPUS MYSTERY 5]-THE CRANE POISON CASE 6]-THE WEEK END MYSTERY 7]-THE WALL STREET MYSTERY 8]-THE STUDIO MURDER MYSTERY 9]-THE TRANS-ATLANTIC MYSTERY 10]-THE SIDE SHOW MYSTERY 11]-THE SKULL MURDER MYSTERY 12]-MURDER IN THE PULLMAN.----------Cole Johnson. For most of its existence the New York Post was one of the most staid papers imaginable. It was the paper of Wall Street, concentrating mainly on financial news. In the 1930s, though, it went through an ownership change and the paper that had only appealed to the gents in the board rooms took a populist turn. 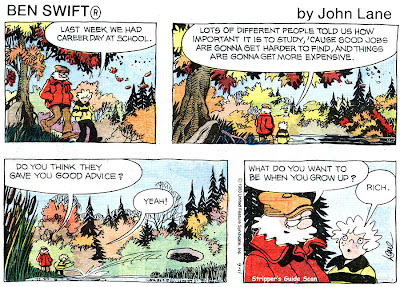 The Post added lots of new features including daily comics. It wasn't until the beginning of 1942, though, that the Post took the really big plunge and added a Sunday (well, actually a Saturday) color comics section. The strips above were printed in March 1942 as advertisements of the new feature. As you can see, most of the Post color comics section was to be composed of the new AP Sunday strips (themselves only as old as late 1941) , including Dickie Dare, Homer Hoopee, Scorchy Smith and Oaky Doaks. To this they added Mutt and Jeff, Abbie 'n Slats, Captain and the Kids, and Nancy. The last strip is Post staffer Stan MacGovern's Silly Milly commenting on the new addition to the paper. MacGovern tries to be jaunty but it's pretty obvious he's not entirely happy with the addition. Guess he didn't want the competition. A tip of the tam to Jeffrey Lindenblatt who sent me these delightful ad strips. This set of changes were implemented not long after the Schiff family bought the Post (in 1939). At this point in time, it was a broadsheet (having been, briefly, a tabloid), before reverting to tabloid format in 1942. One imagines that with the Journal-American in town until the 1960s, they didn't get much King Features product. The Post did, for a while, experiment with colour comics again in the early 1990s, though today they don't run Sunday comics, and have a very slim, largely forgettable comics section. Pity. Either the Sun or the Post could make a splash by allowing for new talent. Thanks to all who sent questions and comments on the Stripper's Guide Index application preview. Here are my responses to your input. We'll start out with the contents of the SG Index, then go on to technical and publication matters. Q Does the index get into the related subjects of cartoonist biographies, syndicate histories, etc. A The index doesn't try to provide biographical information. You can track the movement of cartoonists from one paper or syndicate to another through the titles they created, of course, but as far as birth and death dates, details on their personal lives, no. Maybe in another few decades! Regarding syndicates, though, I have been maintaining a document of vital statistics on syndicates for the the past dozen years that I update as I find info. This has not yet been published in any form. It will presumably be included with the Stripper's Guide index, probably as part of a help system. Q Does the SG index cover ghosts, assistants, staffers, etc. A When I get information on ghosts and assistants I usually include that in the notes for the associated strip. Since you would be able to search in the Notes field you should be able to find such information. Ghosts generally do not get a credit in the Artist and Writer sections, which are pretty much reserved for those who 'officially' worked on the features. Q How do you handle weekly and other frequency strips? A Weekly strips have their own frequency category. There's also "Less Than Daily", pretty much reserved for the quasi-daily strips of the 1900s and 1910s. For even more oddball frequencies, like three or five times per week, they get tossed into a catch-all "Other" category with a note detailing their specific frequency. Q Why is the Slim Jim sample you showed in the video missing part of the newspaper name in the masthead? Are you editing these out? A No. I scanned that Slim Jim because I thought it was kind of interesting that when this preprint section went through the presses they somehow lost part of the masthead. Goes to show how little these guys cared about getting it right that they didn't bother to scrap that batch, or try running it through a second time. I never intentionally obscure copyrights or anything like that -- those who do such things seem to be laboring under the fantasy that removing the copyright puts the subject into public domain. Doesn't of course. A All information is, of course, gleefully and gratefully received. I assume if you don't say otherwise that when you send me data that you are consenting to have it cited in the SG index. All data used in the index is credited to the contributor. I should insert the caveat, though, that not all data will necessarily be used -- most importantly reports of strips not currently in the index. As most of you know, the SG index guarantees against phantom features by not listing anything that I haven't seen with my own widdle eyeballs. I'm glad to take reports of previously unknown features and will add them to my research list, but I need sample tearsheets (photocopies and scans are fine) to add it to the list. Originals and proofs don't pass muster as they're no guarantee that the feature ever made it into print. Q Will there be any way to search for features of a certain type, say paper dolls, sports strips, black cartoonists, etc.? A In the current version there is no subject index so I must give a qualified no. For paper dolls a search of the Notes would most likely turn up a reasonably complete list since I usually note such features. A search for black cartoonists would have to be done by searching the syndicate names for "Chicago Defender", "Pittsburgh Courier" and so on, then using those results to further search for those creator names from other mainstream venues. There is actually a subject index in my working database. Unfortunately the idea for it came to me at least 6 or 7 years into the project and the information recorded therein is woefully incomplete. I keep intending to go through the whole title list and fill in subjects but it is a daunting task, and there are lots of features that, years after initially indexing them, I wouldn't have a clue as to their subject matter. Q Does the index include panel cartoons, editorial cartoons? A Panel cartoons are included as long as they are from a series. So you will find Grin and Bear It, Briggs panels, Life's Like That, Dennis the Menace and a kazillion other panel features in the index. Editorial cartoons are not included. I consider them a separate subject unto themselves. Gotta leave something for other researchers, right? Q Did you say 7000 titles?!? A Yes, but I'm afraid I was gilding the lily. I'm actually at 6710 at the moment. On the other hand, if you count alternate titles I'm at 10,244. Q Regarding fair use are there any pros or cons with that issue in regards to which format would be legally more manageable? A I don't believe there is a difference in legal terms between a book and a software application as regards fair use. One way or another you're republishing the copyrighted work of others. Based on my reading the fair use doctrine should cover me for a single example of a given feature. The further I get away from that the murkier the waters become. Of course the syndicates make things easier by not bothering to renew their copyrights on most strips. But as I've said many times before, just because a syndicate doesn't have a legal leg to stand on doesn't mean they can't take me to court and generally make my life miserable. Q Why not make the data open source/free? A Maybe it's the tens of thousands of hours I've put into it, maybe it's the tens of thousands of dollars it has cost me for research trips and purchasing materials. Although I have absolutely no hope of recouping such outrageous expenses it sure would be nice to get some small remuneration for those efforts. Besides, my wife would kill me if I gave it away. For the past 12 years she has gotten exactly one vacation where the destination wasn't predicated on the contents of its local library. I've been feeding her a line of bull all along that there was going to be at least a little payoff for all that. Q Will the application work on a Mac? A I'm not a Mac guy but I was under the impression that the later versions of that OS could run Windows-based applications. Am I misinformed? Q Why not make the application a web-based application? Q How about implementing a way of doing searches within searches? A A neat idea, though I don't know that the database really has enough layering to make that a really powerful feature. I've tried to implement a very basic sort of that 'drill-down' functionality by saving your searches so that you can fine-tune them. I'll let that idea roll around in the ol' noggin and see if any sparks fly. Q Consider multiple sort options. Instead of the initial database being sorted only by title, the ability to change the database in order to sort by year, artist, syndicate, et al would be nice. A That would be possible to implement, but I don't know how it could be used to any great effect within the context of the application. If the index were to be published in a book I had every intention of doing cross-reference indexes sorted by syndicate, creator and start date. I would definitely like to come up with a way of sorting the index without regard to upper/lowercase, spaces etc. I have it doing the sorting that way when printing hardcopy but haven't come up with a way to do it (easily) in the app. That's something I would definitely want to implement before the release though. Q Consider some ability to export information to allow limited exports of search results or checklist generation. You can create tags to protect your copyright. A Factual data, which of course is the bulk of the index, is not copyrightable. No one can own facts (thank goodness). For that reason I have reason not to allow exports, because once the data is just in the form of a list of titles and dates I can lay no legal claim to the work. Not allowing exports gives me at least some semblance of control over its dissemination. By the way, it's for that reason that there are some ringers in the data just in case anyone gets any bright ideas. Q Consider the ability to add more than one thumbnail, especially with strips that had multiple artists over the years. A With multiple artists I think fair use might well cover multiple samples. Not sure how I would set that up in the application but it's just a matter of expending some brain juice on it. I'll see what I can do. Q Would the index be released letter by letter as it was years ago? A No, the whole index would be released. Q How about instead of referencing only your blog postings in the app you reference any website that discuss or reproduce samples of a given title? A Sounds great but that would be a huge project unto itself. How about a button that will automatically open your web browser and do a Google search for the title? That shouldn't be too hard to implement. Finally we come to the biggie. I mentioned in the video that my real dream was to have the index published in book form. I said that I was prepared to back off from that dream because Stripper's Guide research continues indefinitely and that provides no obvious stopping point at which to publish. I was surprised and thrilled to find practically every commenter saying that they would really like to have the index in book form even if it needs to be updated on occasion. Well, if a book is what I want and a book is what you want then I'm going to give a serious reassessment to the subject. A lot of you mentioned print-on-demand (lulu and the like). I'm willing to go that direction but only after at least approaching some 'real' publishers with the project. A book publisher can do a far better job of production on the book than I could, and comes with a marketing engine that would hopefully put the book onto a lot more bookshelves than it ever could going the self-publishing route. For instance I see libraries as an important venue for a book edition and I seriously doubt that librarians are combing through lulu looking for reference books. Ringers? Oh, Allan, please say it ain't so! The ringers that Overstreet have had for years in his listings have long since been discovered by collectors and folks down the line will eventually parse your work for them too. The problem is that your hard work is more than a commodity. Its more than that. It is a source of historical research that will be used and judged by your peers and future scholars for decades. The moment you include poison pills into the data to protect your monetary claims to the information, is also the moment that you help make your data suspect for all future scholars. The question will become for someone using the data 50 years from now, which is real and which is fake? What you have done is a historical and scholarly achievement, which is for posterity as well. Don't undercut yourself with future researchers. For the Mac question, the new Mac's run on Intel processors in which can run Windows software. I run the old Stripper's Guide myself on a Windows emulation program. If someone has an older Mac or does not have such software, they will not be able to use your software. As far as web-based software. If you don't know how or have the time to write it yourself, how about inquiring from folks who do and have them write it for you? And it might not have to cost you anything either and here is how... The Grand Comic-Book Database project (www.comics.org), has a tech list that is full of computer and software savvy people/comic fans who have been working on a new schema for the database. All free, all volunteers. There has to be plenty of folks who love the Stripper's Guide who also could help you write the program you want as a web-based model in no time at all. The right programmer could probably knock it out for you what you want in no time. The problem will then becoming web hosting, and that is an entirely different matter long-term. But that is more an issue of money and bandwidth at that point. Yeah for a book copy! My only fear might be the price! Regarding the ringers, for reasons that I'll keep mum about they're perfectly obvious to anyone actually reading the listings -- they're only going to act as gotchas if someone was copying the material en masse. By the way, there originally weren't any ringers. They were added when it became obvious that some subscribers to the old version of SG were distributing it to others. Re Macs, thanks for the info. Perhaps the application could just be recompiled for 'native' Mac use. I don't think the MSVC compiler has a Mac equivalent using common calls but I'll look into it. AAAAEEE!!! I'm one of the people who suggested Lulu thinking you'd release the darn thing now at a reasonable price, Alan! Really, you will not find a publisher who will do any editing on this for you, and it will have an exorbitant price. Ask John Lent about his experience with his bibliographies if you don't want to take my word for it. A full set of his 10 bibliographies will cost you about a grand and a half. If you can export the data, you can self-publish. I'm a bit late into this conversation, but I have a suggestion or two. Perhaps you could publish the printed index in sections (for example, A-C, etc.) and sell them with 3-hole-punches that can be put into a Stripper's Guide binder that you could also sell. That way you would reduce the price to the buyer, who could purchase the index bit by bit and it would also allow you to make updates to it and sell the updated pages separately. It would probably reduce the initial printing cost as well since there would be no covers. Good luck! I look forward to seeing the index in print. You've done an amazing job.